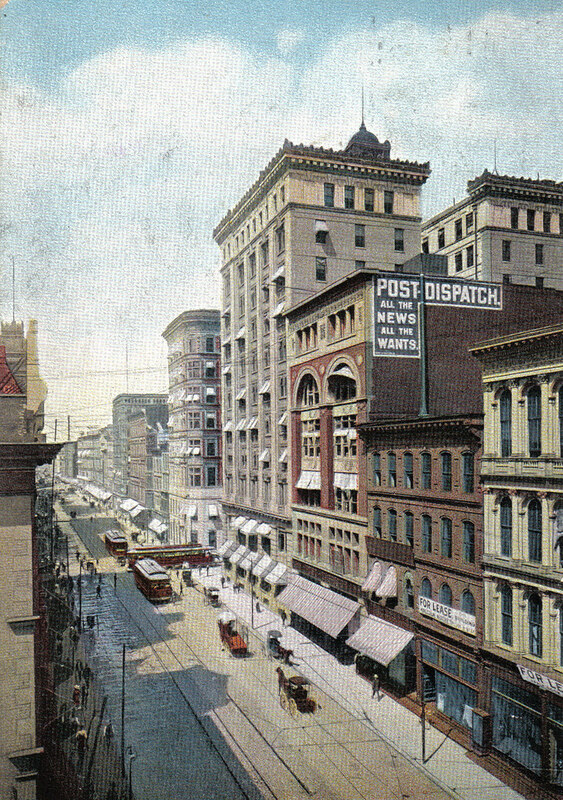 This colorized postcard of Broadway dates to around 1900 and shows a downtown street populated mostly by three- or four-story commercial buildings. The view is looking northeast from a point just north of Pine Street on the west side of Broadway. 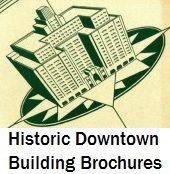 Even at this time, however, Broadway and its eastern neighbor Fourth Street were home to dozens of banks and financial firms. These streets comprised the city’s financial district. Some notable buildings seen here are the St. Louis Post-Dispatch building (later the printing plant after the paper’s move to 1139 Olive Street in 1917) and the National bank of Commerce Building directly north of the newspaper building. The building with the curved corner across the street is the Commonwealth Trust Company Building. Further north, at St. Charles Street and much larger than surrounding buildings, is the B. Nugent and Son Dry Goods Company Building. The array of awnings on all floors of these buildings also stands out.